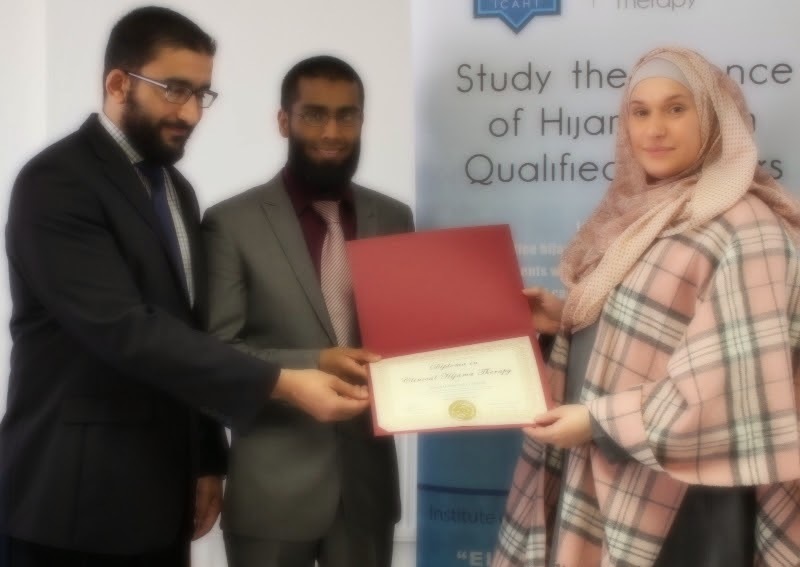 By the grace of God we have been honoured to present our very first class of students their Diploma Certification in clinical Hijama therapy. The first ever ICAHT graduation ceremony took place at the ICAHT Centre of Integrative Medicine and was held on Sunday the 27th of April 2014. The students who started the course in June 2013 had come a long way in the span of one year and this was evident from the level of both enthusiasm and professionalism that they delivered their final case presentations. The presentations shortly began with an extraordinary level of passion and enthusiasm. The graduates explained how they had helped so many individuals by utilising the therapy. By sharing their case studies they initiated both intrigue and discussion in the class. Witnessing the various approaches and also integration of other therapies and techniques, tutors and students alike were inspired by the various clinical applications of the therapy. Over Lunch both tutors and students had a major catch up and it was encouraging to hear that Sr Kareema Crawford had set up a private clinic, Br Naveed Gul was in the final stages of setting up practice in a local pharmacy and Sister Durreshehwar Mirza had opened a professional government recognised clinic in the UAE. We also had news that Ms Giovanna Recchia had become quite a popular Hijama practitioner and that the therapy had taken her to practice on patients across the oceans in the USA, Belgium, Italy and the UAE. For a non Muslim student who initially thought she would have difficulty finding 15 patients to write her case reports on she had done pretty well and described her non Muslim patients begging her to come back to provide more treatments. We also saw that there was a bridging of working relationships between the students of medical background and non medical backgrounds and that this generated fertile ground for the two groups to work together in clinical practice. The prize of best presentations was awarded to Br Naveed Gul of Birmingham who presented his cases in a very clinical and well-researched manner. had applied academic vigour to her case reports meticulously researching and referencing all of her statements. 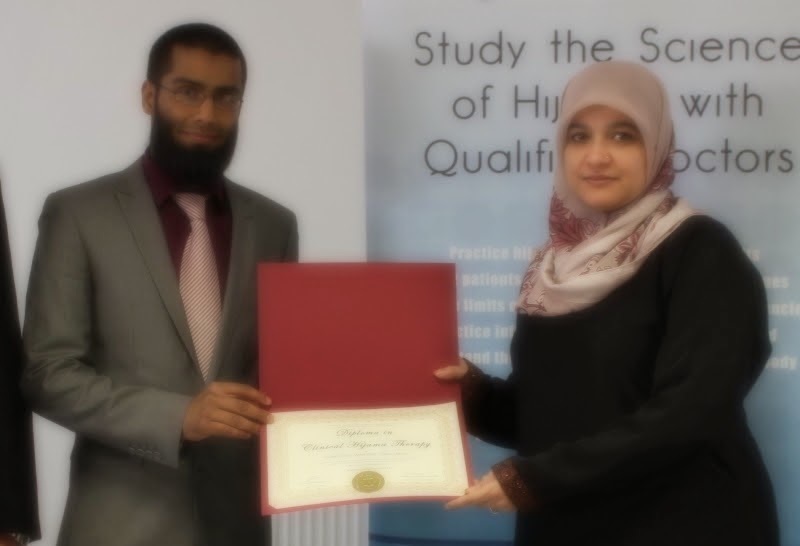 experienced hijama practitioner from the U.A.E who consistently delivered in all aspects of the course. To undergo Hijama therapy has been for many people in the UK quite a daunting task to undertake due to there being such a wide range and level of competency when it comes to practitioners. The lack of regulation has meant that anyone with the willingness to pick up a blade was able to put himself or herself forward as a hijama “specialist” and begin charging up to £70 per session to unknowing people in their community. With no standardised level of education, understanding or knowledge of the human body, health and disease or even infection control people were often finding themselves in uncomfortable situations being treated by individuals that they could barely trust. 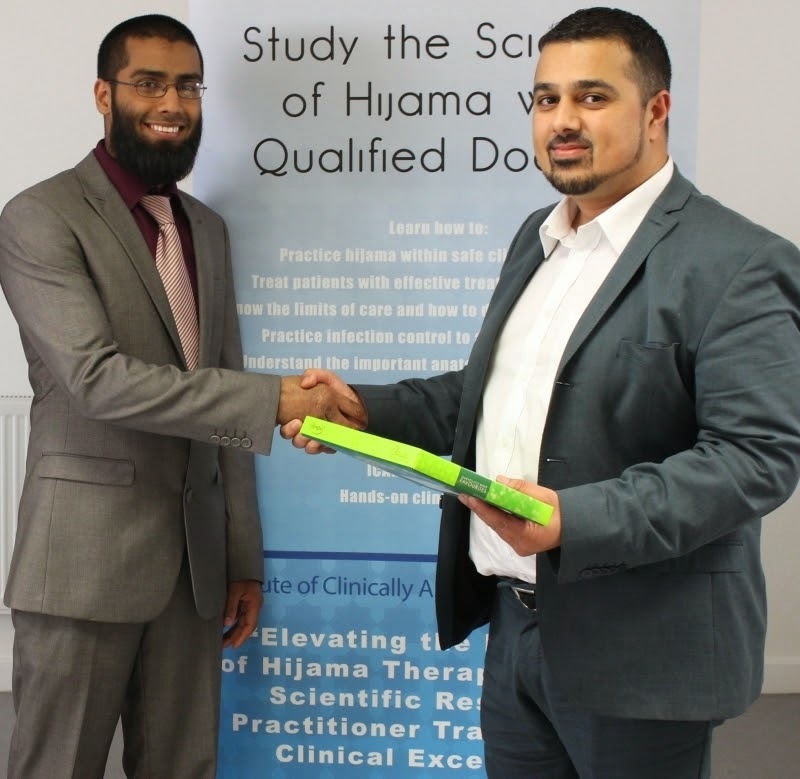 In 2013 ICAHT (the institute of clinically applied hijama therapy) gained a GRCCT appointed title as the Lead body for the practice of clinical hijama in the UK in line with government regulation and became the first fully registered professional association for self regulation in the field of Clinical hijama putting the level of regulation on par with that of the practice of Acupuncture. In addition to the advances that ICAHT have made with regulation, recent changes by insurance providers have meant that major insurance companies that insure complementary therapy practitioners have refused to insure practitioners who study hijama through online courses or single day /weekend workshops. One of the leading insurers state, that practitioners being insured under the practice of hijama therapy must have undergone at least a 6 months course of face to face study in the field of hijama therapy and must have undergone at least 100 hours of class room teaching that includes a level of study in human anatomy and physiology. In line with these changes ICAHT have guaranteed that all practitioners registered and regulated with their organisation will not only be trained to the required minimal standard of education but will have also been verified to be insured with at least £4million of professional indemnity insurance cover to safely practice in the UK. ICAHT professional members are also subject to a regulatory process and agree to adhere to a strict code of professional conduct. If they are ever thought to have broken this strict code, a complaints procedure and policy is in place to take forward an investigation into these claims. Each member has a unique registration number that can be checked and verified on the www.ICAHT.co.uk website and all practitioner members are encouraged to display their certificates on site for patients to see. Looking for a GRCCT certified practitioner in East. London. Area.